This is all about Odysseus, with a 74m (243-ft) wingspan and zero-emissions advantage. 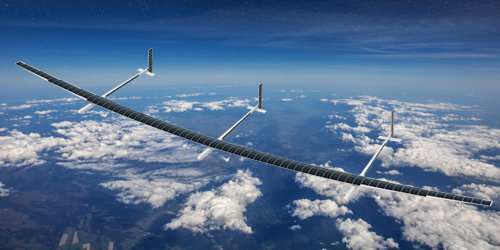 The solar-powered, autonomous aircraft is described as a "pseudo-satellite," or HAPS, which stands for high altitude pseudo satellite. This effort to send up Odysseus has been under way for years, decades. "The inspiration for Odysseus started with the Daedalus Project that ultimately set records in distance and for human-powered flight in 1988 with a 72-mile flight between the Greek islands of Crete and Santorini," said a company news release. "The project was organized and led by Aurora President and CEO John Langford and other MIT colleagues who later founded Aurora. Daedalus' records still stand today." Tom Clancy, the company CTO, said it is designed to fly "almost indefinitely" only on the power that it gets from the sun. The Engineer discussed this. Odysseus is designed to operate in the stratosphere where there is continual exposure to sunlight during the day. That allows them to harvest enough solar energy to operate around the clock. Nonetheless, although able to stay in the air indefinitely, "missions are likely to last months at a time." As for materials, there are solar cells on the top surfaces of the wings and fuselage. CompositesWorld reported that the structure of the aircraft was built "from trusses made of carbon fiber. Coverings are made from DuPont's (Wilmington, DE, US) Tedlar polyvinyl fluoride (PVF) film, which provides UV resistance." How might Odysseus help the scientific community? Simply put, it will convey climate and weather observations Interesting Engineering quoted Langford. He said it was "now a real solution to advancing the important research around climate change and other atmospheric chemistry problems." The company news release mentioned its ability to conduct weather and storm monitoring during peak seasons. Prof. James Anderson, whose area is atmospheric chemistry at Harvard, spoke in a video about the potential in climate research. Odysseus staying in one location, monitoring over longer periods of time, can deliver information on several fronts. These would include determining ice volume and ice flow; determining soil moisture—important measurements, important issues. Interesting Engineering said Odysseus was "highly adaptable and reconfigurable." It can continue to be repositioned and reprogrammed according to mission requirements or even technology advancements. At a fraction of the cost of a satellite, said the company news release, "It can receive payload and hardware options and can be quickly customized, re-tasked, and re-located as missions evolve." Graham Warwick, covering technology for Aviation Week, said the Odysseus was in ground testing. Its first flight is scheduled for Spring 2019, said reports. Rich Haridy, New Atlas, brought out some points about HAPS in general. "HAPS are designed to occupy that sweet spot between conventional UAVs and traditional satellites," he said. "In theory, these completely autonomous aircraft will be able to fly for an indefinite period of time, powered by solar energy and traveling at altitudes of about 20 km (12 mi), above clouds, jet streams and winds in general, and commercial airliners."